I was in Lake Havasu last week and sadly they are out of business. Erika's friend Kimberly has been telling us about a great Greek restaurant in town so we decided to have lunch there Saturday. Am I ever glad we took her recommendation, I had one of the best lunches I've had in a while. 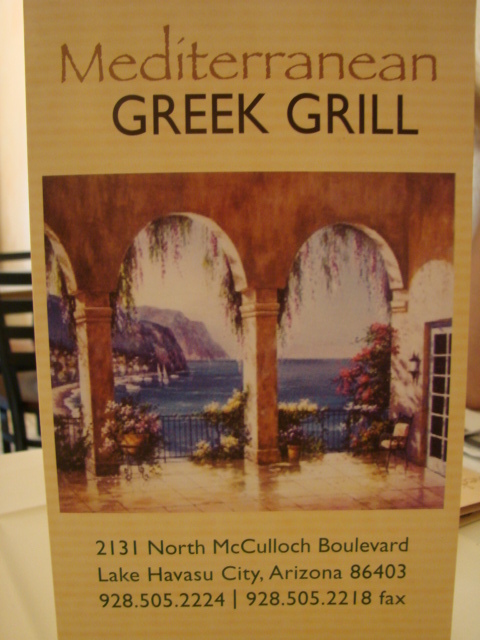 We went to the Greek Grill. We ordered the Appetizer Sampler for two. It was large enough for the four of us and then some. 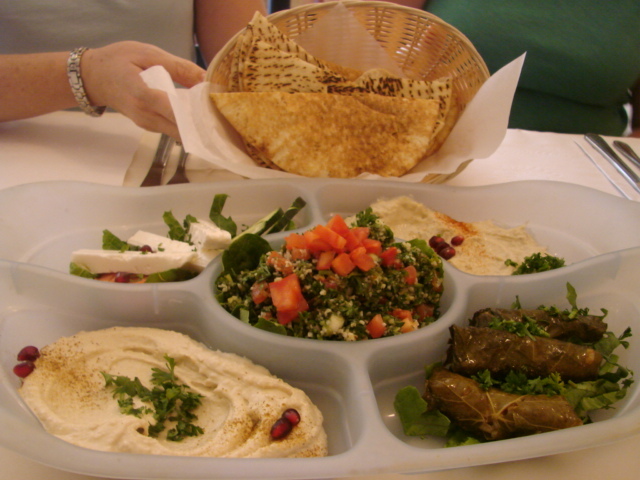 The items on the sampler are Hummus, Tabbouleh, Baba-Ghannouj, Feta cheese and Dolmades served with warm pita bread. Kimberly had the Lamb Gyro sandwich. 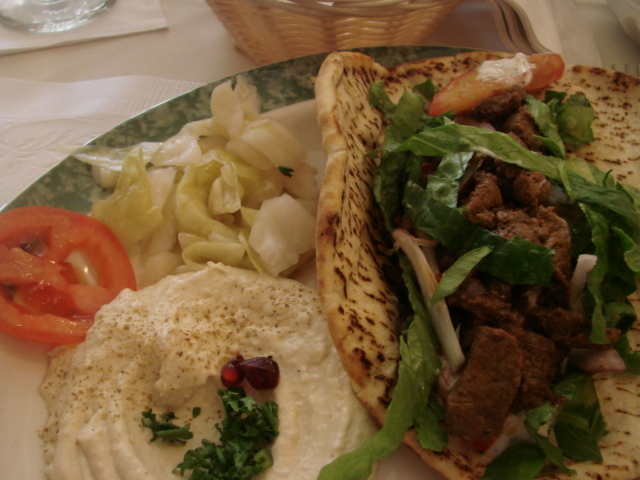 It was, according to the menu "Succulent lamb gyro slices, grilled and served with Tzatziki sauce." Also included on the sandwich plates was some hummus and homemade pickles which is pickled cabbage, what a treat. 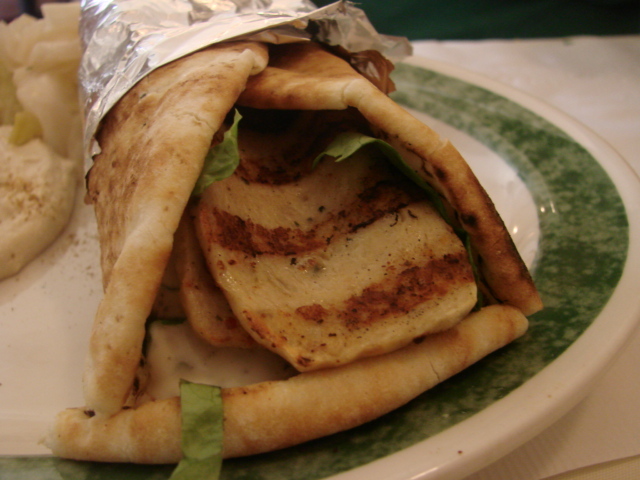 Erika ordered the Chicken Gyro which is "Succulent chicken gyro slices grilled and served with tzatziki sauce." She loved the sandwich and we all agreed the pita bread was above average. I had the Lamb kebab sandwich. It is according to the menu "Brochette of tender, lean New Zealand Lamb, marinated and seasoned with our special recipe" This was to live for delicious. The lamb was tender, and juicy. The flavor was spot on, one of the best lamb dishes I've had. 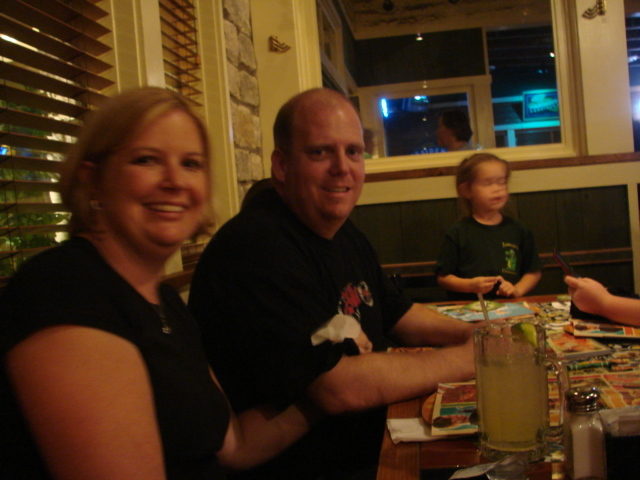 I can't wait to go back and have one of their dinners. 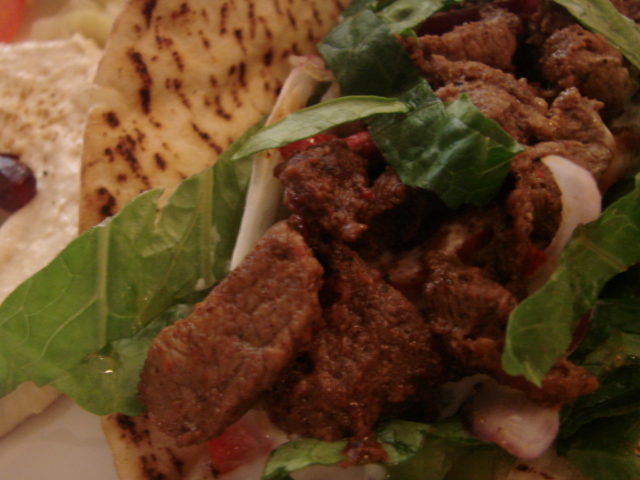 Close up of the lamb kebab sandwich. 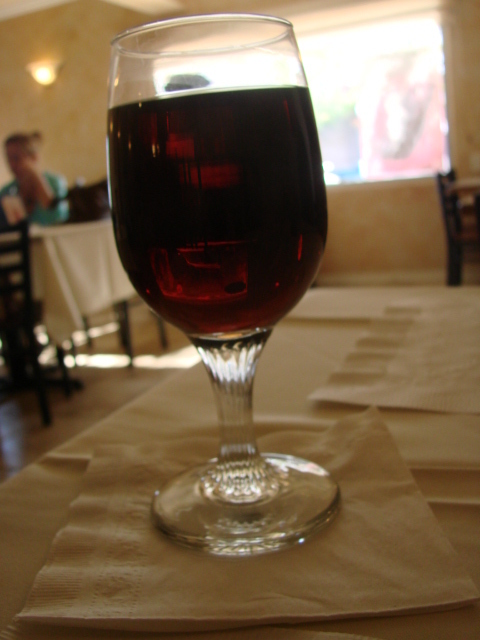 I was going to order a Lebanese red wine Massaya but the waitress Cindy said the chef suggested I have a Vedi Alco pomegranate wine with my meal. It's not really a red but more of a dark rose, and is semi sweet. I really liked this wine with lamb. I'm going to buy this one. 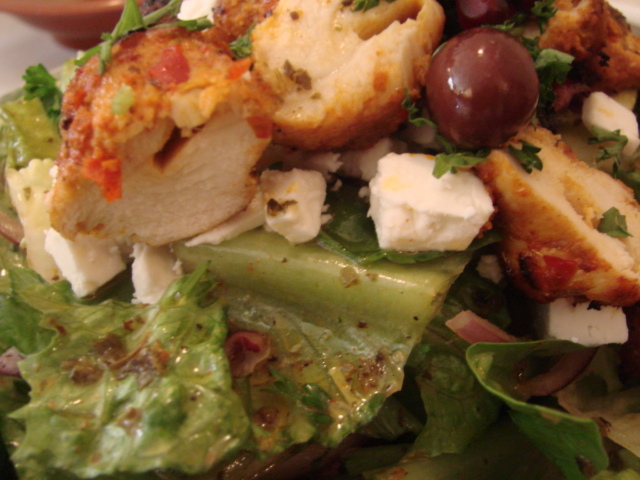 Vicky had the Greek salad, it was made with romaine lettuce, fresh spinach, tomatoes, cucumbers, topped with Mediterranean olives and crumbled feta cheese and served with their signature dressing. 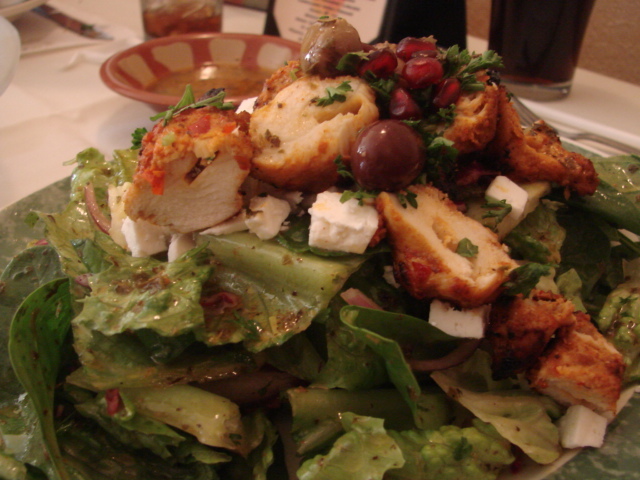 She had it topped with their grilled chicken breast which were nice big pieces of perfectly seasoned cooked to perfection chicken. Our knowledgeable and very efficient waitress Cindy, helping Kimberly and Erika with lunch choices. We were delighted at the end of the meal with a couple of desserts sent out by the chef. I think we were in the right place at the right time because the owners were sampling some new specials and we lucked out in getting some. 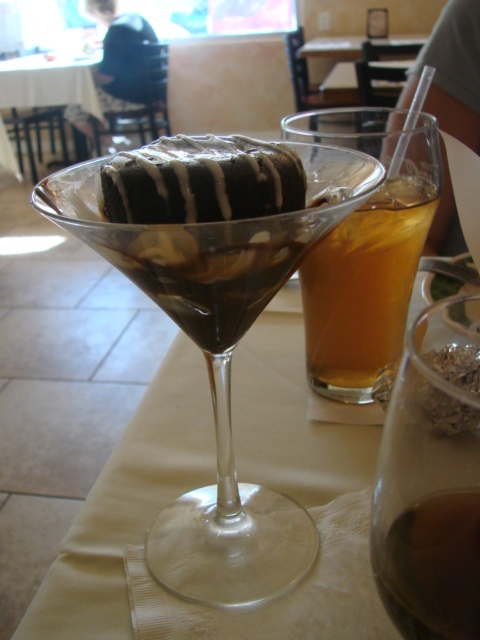 One dessert was not on the menu, when we asked Cindy what the name of the dessert was she said chocolate fudge cake. Well, chocolate fudge cake seemed a pale description of what we ate. 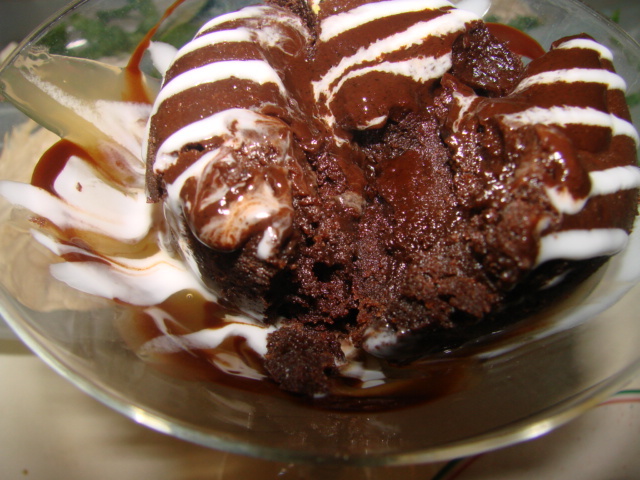 The cake is served hot with hot fudge that oozes out of the middle with the first spoonful. We were ooohhhing and awwwing over it and in our silliness decided to name it Choclava. 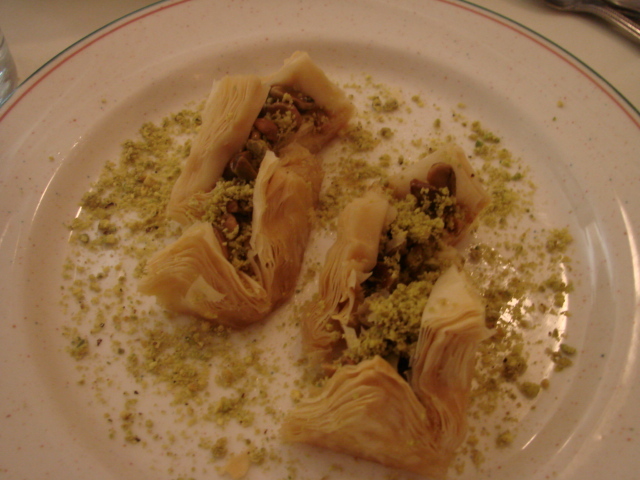 We were also served the best backlava I've ever had, this of course is on the menu.It's a dessert of flaky filo dough stuffed with chopped spiced nuts and topped with honey and pistachios. I like that the backlava wasn't saturated with honey. All the elements of the dessert can be enjoyed and not be overwhelmed by the honey. Loved the generous sprinkling of pistachios. They also have a Hookah patio. Here's what the menu says. "Come in and enjoy a hookah with your meal, or with an Armenian Espresso or dessert on our outdoor patio." Some of the flavors are, double apple, cantaloupe, cherry, strawberry cappuccino, mixed fruit, mint. Smokers are 100% tobacco and tar free. Didn't do this. I'm looking forward to eating here the next time I come back to visit. I'm in Lake Havasu AZ visiting daughter Erika and her family for Erika's birthday. 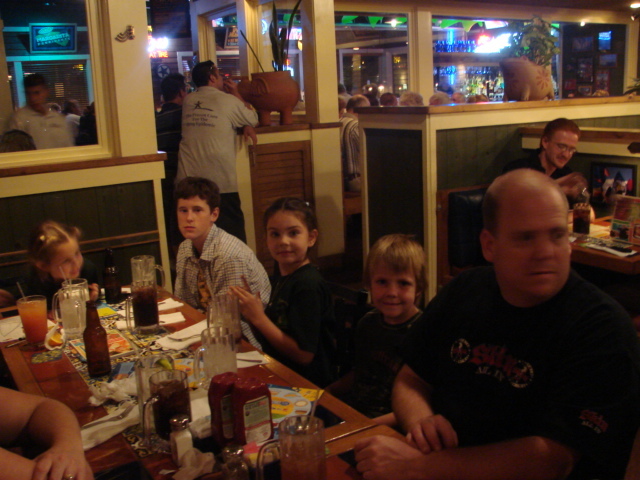 Her boss Jeff (at end of table)took us all out to Chili's for her birthday. I had the Southwest cedar plank talapia. 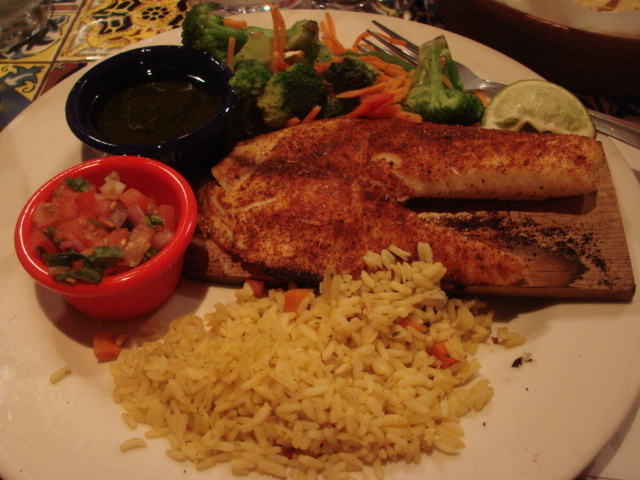 According to the menu it's "A seasoned tilapia fillet topped w/chimichurri (cilantro, garlic & lime) sauce & pico de gallo. Cooked and served on a cedar plank w/seasonal veggies and rice." I ordered the sauce and pico de gallo on the side. The veggies were barely warm and a little overcooked but the chimichurri sauce was delicious. I almost didn't order the fish because I was afraid it would be overcooked but it wasn't. It was quite tasty. Jeff ordered their Chilis Philly Cheesesteak according to the menu, "our seasoned, sliced steak is grilled w/onions, bell peppers, mushrooms and smothered in melted provolone cheese." Jeff ordered it without the mushrooms. He specifically told the waitress that he absolutely did not want mushrooms on his sandwich, he told her that he's ordered that sandwich three times and every time he still gets mushrooms on it. Well it came with the mushrooms on it for the fourth time. He disgustedly started picking the mushrooms off his sandwich. I brought it to the attention of the waitress to which her reply was, "yeah, I noticed that when I picked it up" but she served it anyway, go figure. I'm of the contention that most chain restaurants receive most of their food prepackaged, pre-sliced, all ingredients in one package that only needs to be heated up and served. 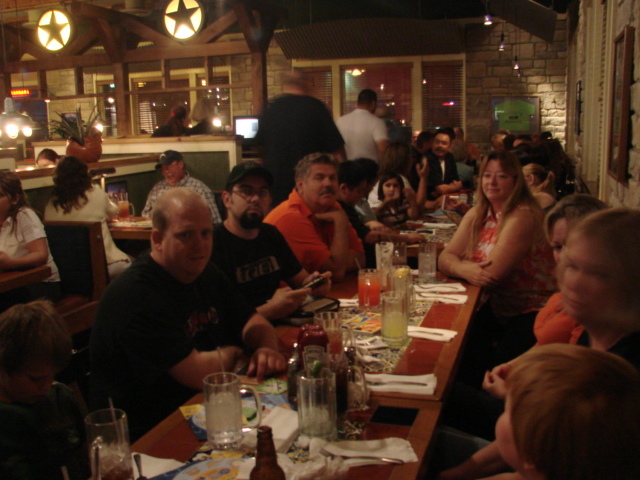 Jeff considers Red Lobster and Outback Steakhouse type chains to be up-scale restaurants which opened up another whole discussion. I ate, I was happy. I was with my daughters and friends and a good time was had by all.